Hip hip hooray it's Friday! I feel like this week has been a whirlwind of work and I'm so relieved that it's nearly over. If I'm lucky, I'll have absolutely nothing to do this weekend - I miss the days of having nothing to do except hanging out on the couch with a dvr full of shows and movies. What are you planning this weekend? Today I have the Zoya Magical Pixie collection for Summer 2014, a unique collection of pixie dusts that have larger hex glitters within the texture base. This is the first time I've ever used such a combination of glitters, and conceptually I really like the way it looks. The larger hex glitters catch a lot of light and allow for much more sparkle compared to original PixieDusts. The range is limited, which I thought was odd, it is composed of a gold and two shades of pink. My only gripe with this collection is the sheer formula - it seems that at least three coats were needed for me to build up sufficient opacity with minimal VNL. First up is Ginni, a baby pink texture that really allows the holographic glitters to pop when light hits it at the right angle. This is the lighter pink of the collection, and not a color I would normally choose. Surprisingly, I like the way it looks on me! Bar is a gold texture that really works well for summer. I don't know what it is about gold, but it's a fashionista's best friend in the summer and pairs well with anything, especially sun kissed skin. If you're looking for gold bling, Bar is your answer. 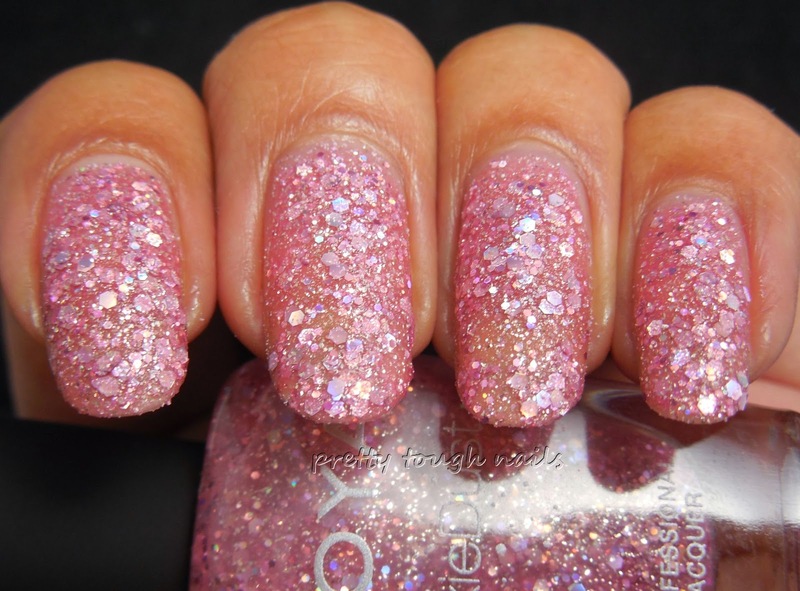 The larger glitters really give this a jewel encrusted look that is very decadent. Finally I have the darkest shade of the collection, Arlo, which is a dark rose PixieDust. This one is probably my favorite from the collection, as I usually gravitate towards darker shades and the rose compliments my skin tone well. The hex glitters in this shade isn't as dense as the previous two, which unfortunately means a little bit less sparkle. Overall, I really liked the way these all look, especially when the holographic glitters catch the light and make the polish sparkle like crazy. I wish these were more opaque, but I believe that can be fixed easily by adding a similar base color underneath so there isn't any VNL showing through. I forgot to mention that after these dry, the texture isn't any rougher than the standard PixieDusts, and if anything, the larger hex glitters actually give it a smoother feel. I'm glad that I picked this up because they're unique to my collection and are so incredibly sparkly. Do you like these, and would you give them a try? These are really pretty! My favorite is Ginni. It does kind of stink that they're somewhat sheer but they don't look too bad. Yeah, they're not too bad IRL if you're not looking too closely. I think they'll probably be better over a base though, if sheer polishes annoy you. They're still really pretty despite all that!